Uncovering New Writing – Poetry, Prose and Plays – Bare Fiction Magazine – Guest Blog by Robert Harper. When Kaite O’Reilly asks you to write a guest article for her blog about your own project, you get that little warming feeling that the road you’re embarking upon might just be the right one. So I was delighted when she suggested I write about a new literary periodical I’m publishing called Bare Fiction magazine. I’ve long been interested in the process of creating words on a page. How did our great 20th century dramatists, poets and novelists manage to compel us to follow their every literary whim and where do our contemporary writers find the new bones of these fantastic bodies of work that the theatrical and publishing world has helped make flesh on which we joyfully feast. Now for some peculiar reason, though I’ve happily spent the majority of the last 20 years as a performer, I have always had a deep desire to produce a literary magazine. Perhaps it was initially fueled by long nights in my early twenties spent drinking bourbon with my dearest friend, imagining we were beat poets. Perhaps it stems from performing in some fantastic plays and feeling sadness that the words we shared may never find another’s ear or leapfrog off the page and be made whole by someone else’s brain. Like so many creative artists, I found myself wondering how my endeavour was going to be different. What could I possibly do to make another literary title stand out from the many others on offer? Then I realised something that up to that moment hadn’t been apparent to me. Nobody else was including playwrights within their magazines. And by that I mean that I could find no evidence that dramatic texts were being discussed on their literary merit or published in part or in their entirety within another literary title. This should have been my eureka moment, but this was always my intention. 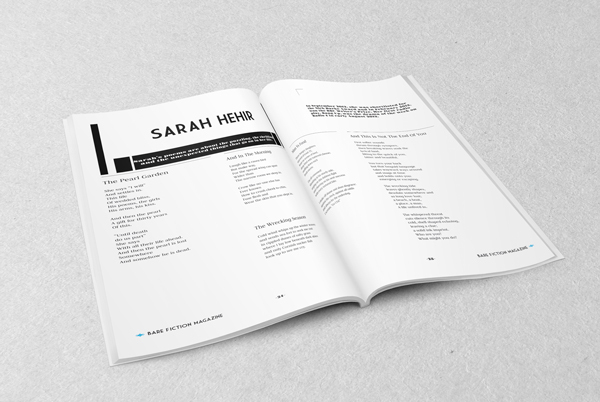 It was so obvious to me that play texts and playwrights would be a part of my magazine alongside poets and poetry, authors and short fiction, that it never occurred to me that someone else wasn’t doing it already. But why me? Why did I think I was the one to do it? As I said, I’ve been fascinated by the written word for decades and so it seemed like the natural time to do a little bit more study to back up my editorial journey by enrolling for an MA in Creative Writing. This fuelled the fires and I began to see that, like anything, you simply need the passion to succeed and with the kindness and support of a few friends, you can make it happen. Except of course in these difficult economic times with grants for the arts and council subsidies being cut in every corner of the country where would we find the money to produce the print copies of the magazine. My fellow editors (Lisa Parry, Branwen Davies, Emma Andrew, Tom Wentworth and Amelia Forsbrook) and contributors were all adamant that they wanted to help the magazine get off the ground by offering their time for nothing, but we would of course need to fund the printing costs. During the last few months visitors to the website have kindly been pre-ordering our launch issue which features some amazingly talented writers across all fields. We’ve work from acclaimed playwright, Forward Prize and Aldeburgh shortlisted poet Dan O’Brien with whom I’m also writing an article for the magazine. We also have the full text of Neil Bebber’s superb short play Breathe which was part of Dirty Protest’s Plays in a Bag season at the Almeida this summer. Amongst our poets we have Fred D’Aguiar, Boyd Clack, Adam Horovitz, Roger Garfitt, Dylan Thomas Prize shortlisted Jemma L. King, plus BBC Writer’s Prize winner Sarah Hehir. Short fiction includes work from Jane Slavin, Elvis Avdibegovic Bego, and Katie Bickell. The list goes on and you can of course see full details on the website. I want to continue this journey of exploration of the uncovering of new work by writers at all stages of their career. To discover work of exciting promise and exceptional skill that wakes you up the second you read the first lines. But we need a little help along the way. We’ll be printing three issues a year from next March, but we’re kicking off with a bumper launch issue this December. With that in mind we’ve created a kickstarter campaign to help fund the costs of the initial print run, distribution and promotion of 500 copies of the magazine and we need just £1600 to do that. As I write this our campaign has been live for just shy of 48 hours and I’m thrilled by the support so far. But we still have 85% of our target left to achieve. Please take a quick look at our promotional video (below) and visit our campaign page to pledge support in return for a digital or printed copy of the magazine. We’ve lots of reward options for you to choose from. Thank you and I hope you enjoying reading all the great new writing that we’re going to bring you. The launch issue of Bare Fiction Magazine is available to pre-order via the website or by pledging on the kickstarter campaign page and will be on sale from December 2013 through independent bookshops. Advertisers can also pledge via the campaign to secure advertisement space or visit the website for more details.